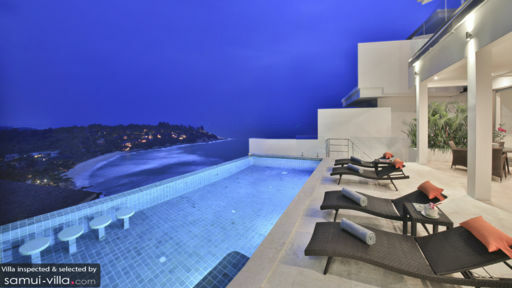 Villa Orchid has all the essentials vacationers look out for when they think about a tropical retreat: ocean views, infinity pool and ultimate privacy. Occupying a tucked away location upon a hilltop, Villa Orchid looks out to a spectacular coastal landscape and boasts a restful ambience. Containing three bedrooms, sun-drenched outdoor spaces and well-appointed living spaces, the villa is ideally kitted out for travelling parties of six. All three bedrooms are spread out across the upper floor. Each offers air conditioned comfort, ample storage space and private en suites. 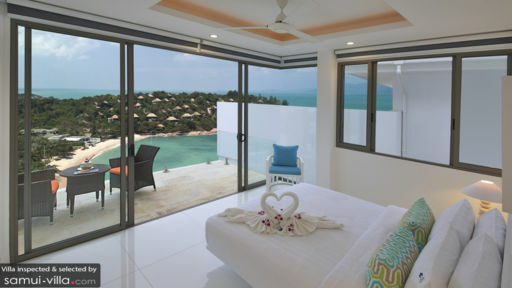 The master suite enjoys a jacuzzi bathtub, while two of the rooms extend out to include a balcony with sea views. The sparkling infinity pool is the focal point outdoors; it’s where holidaymakers take refreshing dips for a respite from the heat of the tropics, and enjoy uninterrupted vistas out to the coastlines of Samrong and Big Buddha Beach. Under-water stools by the edge of the pool offers an incredible pool-bar experience, while outdoor barbecue facilities, bluetooth speakers, outdoor showers and poolside furniture help set the mood right for a pool party. Step in from the patio, and you’ll enter an open plan living area. Full-length glass sliding doors create light-filled interiors, while the minimalist décor style, along with a neutral colour scheme makes the space feel bright and airy. Armchairs and a sofa wraparound a flat screen TV set in the indoor lounge, which adjoins to a dining area and guest kitchen. The latter features a full range of cooking amenities, all-white décor and breakfast bar. Villa Orchid enjoys impeccable service. 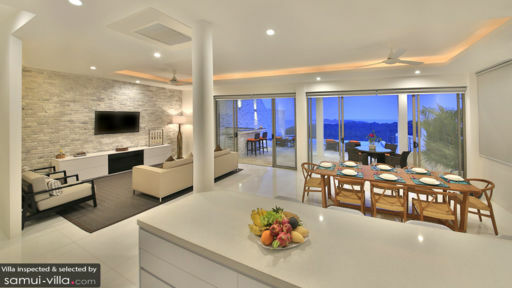 An on-site housekeeper keeps the property spick and span, and private chef services are available at additional cost. In-villa Thai cooking classes are available at request. Villa Orchid is located within proximity to iconic cultural sites on Samui; Big Buddha is 10 minutes’ drive away, while Wat Plai Laem is six minutes’ drive from your villa. You’re never too far away from the coast - Choeng Mon Beach is 11 minutes’ drive away, and a 20-minute drive will lead you to Chaweng Beach. The former boasts pristine shores and a family-friendly ambience, while the latter buzzes with a lively atmosphere and offers myriad dining and nightlife options. When you’re not spending a chilled-out afternoon by the sea, unwind with a spa ritual at the ultra-luxe Six Senses Samui (it’s only three minutes’ drive away!). Choeng Mon night market, located a skip away from the beach is a great way to experience the local food and shopping scene. Joining in a yoga class at Yogarden Samui is one of our favourite ways to kickstart the morning - it’s an activity we’d recommend for holidaymakers looking to spend their vacation mindfully. And while in-villa vacation classes are available at request, vacationers who prefer learning in a group setting may seek out classes at the nearby Island Organics.